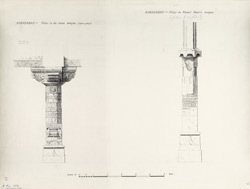 Illustrations of a pillar from Jami Masjid (left) and a pillar in Ahmed Shah's mosque (right) from James Burgess' 'Original Drawings [of] Muhammadan Architecture of Ahmadabad.' The Jami Masjid at Ahmadabad, Gujarat, was built by Sultan Ahmad Shah (r.1411-42) who founded the city of Ahmadabad in 1411 and was responsible for the construction of several buildings and mosques. The Jami Masjid, built c.1424, was constructed as the principal Friday mosque in the centre of the city. The imposing structure is entered from the north side and leads into the courtyard and prayer hall supported by 260 columns. These columns divide the prayer hall into fifteen bays which are crowned by fifteen domes. The central nave of the prayer hall is split into three levels. Along the balconies of the upper levels, there are enclosed spaces for private prayers, separated with beautifully decorated perforated screens. These areas were used by women or the Sultan. In the centre of the courtyard there is a water tank. Ahmad Shah mosque, also known as the Chhoti Jumna Mosque, was built in Ahmadabad's citadel and completed in 1414. An Arabic inscription over the central mihrab records that the mosque was built by Ahmad Shah in 1414. The ground plan of the Ahmad Shah mosque is based on the Jami Masjid in Cambay, built in 1325. The roof is covered with ten large domes and other smaller ones between. Key features of this mosque include the eight perforated stone windows which light the interior and the use of pillars, which originated from an earlier Hindu temple, to support the domes which demonstrate the fusion of Islamic and Hindu architectural styles.